In the first part of this series we familiarized ourselves with the editor and took a closer look at the different tools. In today’s article we’ll build our first map from the start. If you prefer learning the steps with an example, you can download the finished map below. 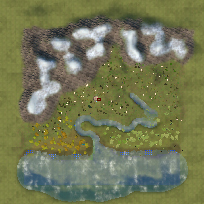 As you can see from the minimap, in the north we’ll create mountains and give the peaks some snow. A river will flow through the valley into the southern sea. The lower plains will feature a dirty swamp and a gloomy forest. The map will also have an underground maze for the heroes to explore. Remember that it is important to save often because the editor can be quite vulnerable to crashes. So start up the editor and we can begin! Click the new map icon and select New Adventure Map. In the Map Name field type in First, for the Map Size select Small (Gridsize 75×75) and Map Type Scenario. The editor will generate a blank map. Now click the Map Properties icon and fill in the information as described below. On the General tab, check Underground. If you uncheck this field in a map with an underground level, it is deleted permanently. Map Name is the name you gave the map at the start. Here you can change how it will show up in the game. Map Description is a brief description of the map. You can use this field to set up the story of the map or give information to the players. Map Author should be your name or nickname, of course for everyone to know who created the map. Hero Max Level sets the maximum level for heroes. Since patch 1.7 the maximum hero level is 999. On the Players tab you can set up the individual players. In a scenario map the first player is always the one you control and can’t be set as an AI player. You can set a custom Name for the player and set the default Faction and Team. In the Control field, “User Defined” means the user can choose whether the player is controlled by a human or AI. You can also set custom starting resources for each player by unchecking the “Use Default” option. For our example map, give the blue player a custom name, set Haven as the faction and leave the Team to default Team 1. To make our map a bit more interesting, set all blue player’s Start Resources to zero. As we are creating a 2-player map (1 human and 1 AI), the Red player will be the AI. Give the Red player a custom Name, select Necropolis as the Faction and leave the team selection to Team 2. Change Control option to AI and use the Standard setting. The AI behavior can be customized, but in this example we’ll keep the selection at standard. Active at start can be unchecked if the AI player joins the game later via scripts. Leave this option checked. Thieves Guild determines whether the AI player is hidden in other players’ thieves guilds until it is discovered in the game. Leave this option unchecked. Leave Start Resources to default for the Red player. On the Weekly Events tab you can determine which weekly bonuses appear in the game. Since Week of Storm is quite powerful (it prevents all ranged attacks) we are going to disable it by clicking on it. A red cross appears in front of the week. Spells tab is basically the same as the Weekly Events tab, you can choose which spells appear in the game. This affects both magic guilds and neutral buildings that grant random spells. In this example we are disabling two powerful spells, Implosion and Tsunami. We can skip the Heroes and Items tabs since we’re not going to disable any heroes or items. Heroes can be disabled individually from different players, the setting prevents them from appearing in the Hall of Heroes. Disabling items affects random pickups, the black market and the merchants on the adventure map. Win/Loss conditions is where you can customize the conditions of victory and defeat. In this example we are keeping the settings at default. Custom conditions can be created with scripts. After saving the settings you may receive an error message saying both players are missing a starting hero, town and a spawn place. We can ignore these messages for now, hide them by clicking the minus sign on the error window. Remember to save the map . Remember that you can lower the mountains by selecting Subtraction from the Noise section. Use the Undo command to step back, or if you feel you’ve destroyed the environment beyond repairing, you can still start over the whole map since we’re not that far in the creation process. There’s also the Flatten tool which can be used to level the ground back to normal. Brush affects the land levels. Brush affects the liquid levels. Paint is the basic brush to change the height of the landscape within the range of the brush. Smooth can be used to level height differences and soften out sharp edges. Flatten the landscape to the height below the mouse cursor. Noise changes the landscape height through applying a noise filter. The filter is always at the same position and changes the same spots as long as the Noise Scale is unchanged. Brush fallout sets the thickness of the brush border to start fading out the height changes. Use Slope Flatten can be used to create diagonal surfaces along the slope below the mouse cursor. Notice in the screenshot how there are some blue dots along the shoreline. They represent tiles where the hero can move without a boat. You may need to save and reload the map before the dots show up. Now we can create a ford for the heroes to cross the river without the need of a bridge. Find a good spot and Smooth the left riverbank to create a passable surface 4. Do the same on the right side and use Paint to raise the ground gently if the river is too deep. Again the blue spots should appear on the ground where the hero can cross the river. When you are happy with how the water and mountains are shaping up, save your map. Now we switch the editor view beneath the surface by selecting the Underground icon . You can test the underground by adding starting heroes to the level and selecting Test Map icon . At this point the underground looks quite boring and grey, so let’s add some textures. We’ll apply Volcanic Ground and Rocky Cliff to make the level look a bit more interesting. Notice that any area not covered in the grid does not appear in the game, so there’s no point in editing much the outer areas. The texture panel also includes four Unused black textures which can be used like any other terrains. Let’s create an area with the black texture, we’ll be using it later. 5 Test the map again and if you’re happy with the underground, we are ready to return to the surface level. Now it’s time to plant some trees on our plain surface ground. Open the Foliage panel . By default our foliage brush is empty so nothing will appear on the map if you try to paint something on the ground. Select a tree from the list (here we use “Pine 03”) and drag it downwards to the area in the panel named Meshes 1. You can also click a tree and press “Add Selected Foliage to Brush” to insert it into the brush. Now that you have a tree inserted in the brush, you can paint the ground with a pine forest. If you want to insert a single tree to the map, you can simply drag and drop a tree from the list to the map. But now use the Undo action to remove any trees you planted. You can add different kinds of trees into the same brush, but to make the outcome more natural, the brush density levels need some adjustment. Once you have inserted several trees into the brush, reduce Paint Density level down to 1%. Now the map doesn’t fill completely with trees when you’re painting it 2. You can diversify the brush even further by setting the density and scale individually for each object. Remember that heroes can’t pass a forest that’s too dense. To understand how the object brush works, take a look at the next image 4. The trees that have a blue background in the Meshes area are active objects in the brush. You can activate/deactivate them by clicking. If none are selected, the brush won’t paint anything on the map. With the selection you can also control what objects you want to be erased from the map (erase by holding shift while painting the map). Now find the spot on the river where we created a ford for the heroes to pass. Plant some Water Lilies in the water. By default the objects are always facing a preset direction, so they may not always look fitting in the environment. You can’t transform objects while in the Foliage panel, so open another panel such as the Heroes panel. Select the Rotate tool and click on the lilies. You’ll see three slices around the lilies: green, blue and red (one for each axis). Grab the blue section and rotate the water lilies to match the surroundings better. 6 With the Rotate tool you can spin any object that hasn’t been placed with a brush. In addition to Rotate, you can also use Translate and Scale to modify existing objects. Now we have created a basic landscape with snowy mountains, an underground maze with lava pits, and planted some vegetation to enrich the surface. On the next article we’ll be adding objects, buildings and portals which will later be used in scripted events. 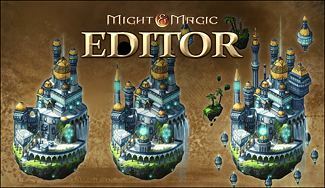 Feel free to ask questions or post comments below, we’re happy to help with any problem you may have with the editor! I just wanted to say thank yopu for taking the time and effort to provide these quidelines in English. It is much appreciated.